Mick has been working to conserve wildlife and habitats for over 16 years, including working for the North Wales Wildlife Trust and for Flintshire County Council as a Countryside Ranger. Before establishing Wildbanks Conservation in 2007, he managed a River restoration project on the River Colne in the Pennines. His practical experience and project management skills, plus his adaptability and innovation, has enabled him to build Wildbanks Conservation into a sector leading company. Mick holds NPTC certificates in chainsaw operation (CS30, CS31 & CS36), pesticide application (PA1, PA6, PAW), brushcutter, driving with a trailer (BE) and woodchipper as well as Streetworks, First Aid at Work (4days) and Asbestos Awareness (Cat A) to name a few. Mick is skilled in a variety of ecological survey techniques and holds a CL18 (class level 2) Natural England bat license and a Natural Resources Wales bat license, he also holds a GCN license for Natural England & Natural Resources Wales. He can also make a great loaf of bread and pizzas, enjoys carpentry and wishes he had the time to learn to paint. Clare first pursued her career in nature conservation in 1999, moving to Edinburgh to volunteer for the Scottish Wildlife Trust where she discovered her passion for Botany. Drawn back to her home of North Wales she volunteered at Greenfield Valley Country Park where she met Mick assisting on the Natterjack toad reintroduction programme at Talacre Dunes SSSI. Clare then worked for three years on a Great Crested Newt community project in Flintshire and more recently ran an environmental community project in Huddersfield for local volunteers. Much of her time is currently taken up with her and Micks two girls aged 5 and 3 (both of which can already identify at least 20 different insects) and keeping the office running smoothly. Clare’s spare time (of which there is little) is spent in the garden tending to her vegetable plot. First prize for beetroots in the village show is still her greatest achievement! 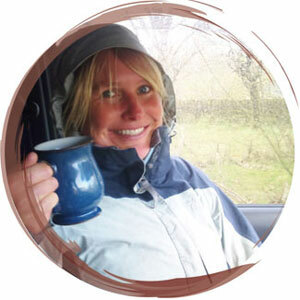 Clare is a skilled botanist and holds a Natural England & Natural Resources Wales GCN licence. Chris lives and used to work on his uncle’s organic beef farm and is adept at working in the natural environment whether its driving a tractor or clearing scrub from a bog. 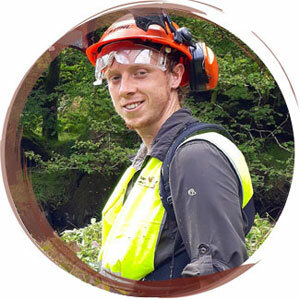 Since graduating in 2011 from Aberystwyth University, Chris has pursued a career in conservation where he developed a particular interest in bats. Culminating in obtaining a Masters in the effects of habitat management on bats and is in the final stages of attaining his bat licence. 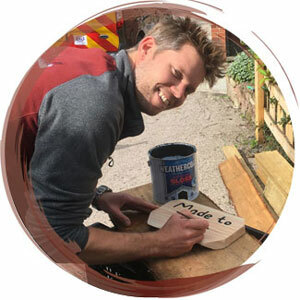 At home in the field with his weather writer or knee deep in mud knocking in plastic piling dams, Chris is an all rounder with a varied wealth of experience who thrives on the challenges of working in nature conservation. Chris holds NPTC certificates in chainsaw operation (CS30, CS31 & CS36), pesticide application (PA1, PA6, PAW), driving with a trailer (BE) and woodchipper as well as First Aid at Work (1 day) and Asbestos Awareness (Cat A) to name a few. Chris is adept at a wide range of survey techniques (bats, GCN, Phase 1, otter, water vole, badger) and holds a Natural England GCN License and Bat License class 2. A keen upcycler Chris enjoys creating things out of some of the waste materials we end up with. Best creation being a rustic table from a forked oak log split in half. Jack started with us in March 2017 and has 3 years experience working on various environmental projects. 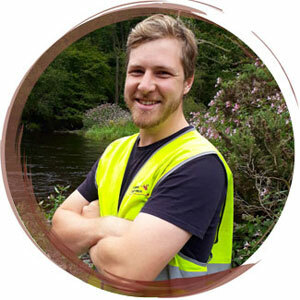 He has always had a passion for conservation and has played an active role in protecting some of his local green spaces by establishing a local voluntary group. With a degree in Zoology from Aberdeen University and a natural aptitude for practical countryside management work as well as an interest in protected species he is already an integral member of the team. Always enthusiastic, Jack enjoys the diversity of the projects we throw at him and enjoys learning new skills. Jack holds NPTC certificates in chainsaw operation (CS30, CS31 & CS36), pesticide application (PA1, PA6, PAW), brushcutter and woodchipper as well as First Aid at Work (1 day). He has relished the veg growing competitions between us this year and is already planning an annual taste off between us all. Wildbanks Conservation works closely with specialist ecologists throughout the UK to assist the consultancy in long-distance commissions so that it is able to provide an efficient, economic, and high-class countrywide service to clients. We are committed to the Health and Safety of our staff, clients and the public. We have been fully assessed and accredited by CHAS (Contractors Health & Safety Assessment Scheme). We are members of CMA (Countryside Management Association) and all staff hold relevant CSCS cards (Construction Skills Certification Scheme). We also hold appropriate NPTC / Lantra certificates in the operation of all machinery that we use.